Voodoo Tiki Shrimp This is a great summer dish that can be used for a dinner party, half portioned for appetizers, or used as pass arounds at your next tequila tasting. Ingredients: •9 oz. 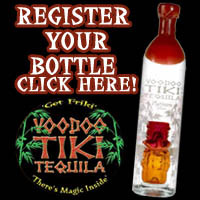 Voodoo Tiki Platinum Tequila • 8 colossal shrimp • 4 oz. agave nectar • 8 ounces fresh lime juice • 8 ounces water • 4 tsp. chopped cilantro • 1 teaspoon sea salt �... more. Featuring Voodoo Tiki reposado tequila, brandy, pineapple juice, orgeat syrup, and overproof rum, Johnny Versus the Volcan was inspired by the Volcano Bowl cocktails found in Chinese and Polynesian food restaurants of the 70's. Johnny Versus the Volcano is an equal opportunity intoxifier "Multi-user" cocktail, served to your tribe in a special, ritual vessel known as a Voodoo Tiki Bowl or Volca... more. H2Ohm blends Voodoo Tiki Platinum Tequila with Elderflower liqueur - both spirits known for being highly aromatic. The result is a summer bouquet that is simple to craft yet complex in flavor. Ingredients 1.5 oz Voodoo Tiki Tequila Platinum 1 oz Elderflower liqueur or St. Germain Liqueur 1 oz Lime Juice 2 slices of fresh cucumber or lime wedge Preparation: Shake al... more. This sparkling twist on the Bellini or champagne cocktail is a terrific welcome cocktail at your next dinner party or tequila tasting event. 1.5 oz Voodoo Tiki Platinum Tequila 1/2 oz fresh pomegranate juice 1/2 oz Lavender Simple Syrup 1 oz Chilled Champagne or sparkling wine Orange twist Preparation Combine Platinum Voodoo Tiki Tequila, pomegranate juice and Lavender Simple Syrup in a m... more. 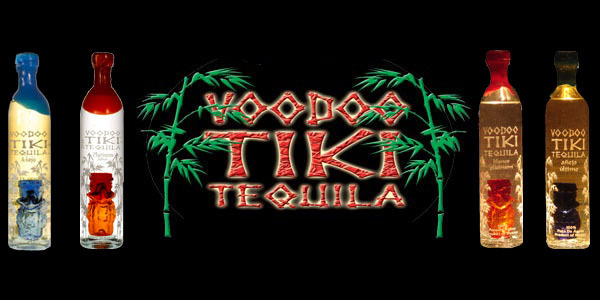 Aromatic handcrafted syrup compliments the equally aromatic, fresh and fruitful Voodoo Tiki Platinum Tequila. Ingredients: 2 oz Voodoo Tiki Platinum Tequila 1 oz Lavender Simple Syrup Preparation: In a mixing glass combine ice, Voodoo Tiki Platinum Tequila and lavender simple syrup. Shake hard, breaking the ice to create surface area and creating melt-age, as water is an important a... more. Lavender is an aromatic flavor utilized in high end Mixology cocktails which pairs perfectly with Voodoo Tiki Platinum Tequila . The purple herb adds highly aromatic, yet light botanical flavor to cocktails, giving the mixed drink a fresh spring flavor. Lavender swizzle can be utilized in a variety of recipes that otherwise called for simple syrup or agave nectar to spruce up and give new li... more. The spring fresh aromatic fragrance of lavender combines with the eye opening zest of fresh lemon in this new twist on the Vodka classic. Featuring fresh juices and handcrafted syrup this is a perfect spring and summer cocktail that will make your guests say, "Wow." 1.5 oz Voodoo Tiki Platinum Tequila 1 oz Fresh Lemon Juice 1 oz Lavender Simple Syrup Lemon Zest Sugar Prepar... more. Voodoo Tiki Strawberry Margarita Pie Tequila tastings don't have to include a lavish dinner party. They come in all shapes in sizes, including an after dinner desert event featuring a flight of Voodoo Tiki Tequilas. Here's a great dessert idea for a tequila tasting after dinner event. 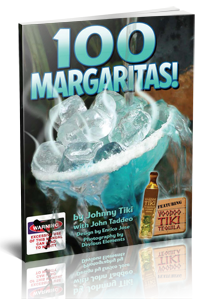 Don't forget to download the Voodoo Tiki Margarita Mixology guide 100 Margaritas! for dozens of desser... more. Simple syrup, also referred to as swizzle, sugar syrup or utilized as a replacement for "Gomme Syrup" is a versatile mixer used in many cocktails. Swizzle is an essential item to stock in any bar, and is both simple and economical to make yourself. Swizzle can be found in many mixed drinks including Mojitos, Daiquiris, Hurricanes and the popular Voodoo Tiki cocktail the Delores Park Swizzle.�... more. Lime zest can add intense, eye opening flavor to a cocktail, and makes a great garnish when floated on a cocktail with the consistency to hold the weight. It's best used in two manners, getting the flavors and essential oils from the zest through steeping, or added at the end of mixing the cocktail as an additional flavor or garnish . There are a number of tools recommended for zesting limes, b... more.